This instrument is based on real samples of a 1978 Fender Rhodes Mark1 fully restored with clean pickups and tines, new grommets, new hammer tips, etc, so it is the best an electric piano can sound. Acousticsamples model gives you access to a 100% continuous response, a very small sized library (80Mb) and a very high tweak ability. It also ensures that the staccatos and releases that make up for half of the realism sound perfect, not like a fadeout, not too loud, just perfect. They found a way to combine both technologies by using samples as the sound source and all the rest uses modeling techniques. 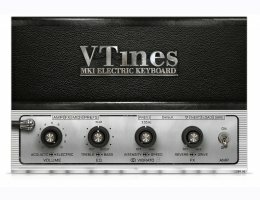 This allows the V Tines to weight only 80Mb (retina graphics and presets included), to really sound like a Fender Rhodes with all of its imperfections and to have a fully continuous response (if you're not convinced, listen to the 127 velocity example in our video) as well as a highly tweakable sound. Pre 1969 Rhodes only had a mono tremolo, so that option was added and you can get that old school vibrato effect. Rhodes are often recorded through the direct output, but the suitcase models have a stereo amp that has a very recognizable sound with two 12' speakers facing the front and two facing the back and each side. The AMP simulation is true stereo, meaning there is a very precise stereo image which is extremely useful when the Vibrato is on. Rhodes pianos are often used with FX, so there is an FX panel with the most common ones, each of them is one of the very efficient and high quality FXs made by UVI. Each FX can be tweaked in real time. Every keyboard has its own MIDI response. The MIDI mapper allows to adjust the response of the V Tines velocity by velocity if necessary, and we created a tool that does it automatically by analysing what you play. Just repeat a few linear velocity repetitions and it will be all set and ready to play. Sampling and modeling hybrid of a Mark1 Fender Rhodes. Perfect staccatos and release samples. Around 35 high quality presets. Very detailed Rhodes AMP simulation with different mic placements and true stereo response. FX Pedalboard with 8 high quality effects. Auto keyboard velocity adjustment tool. Acousticsamples use the iLok system to protect their products, and you can choose to register your license to your computer or to an iLok dongle. If you decide to use an iLok dongle, generation 1, 2 and 3 are compatible with their products. You can activate your license on up to 3 computers or iLok dongles at the same time and you can deactivate one and activate another as many times as you want.